This entry was posted on Friday, September 6th, 2013 at 1:00 am and is filed under Uncategorized. You can follow any responses to this entry through the RSS 2.0 feed. You can leave a response, or trackback from your own site. Thank you for your wonderful post on the power of dance and healing, particularly for cancer survivors. Tiffany’s ‘Dancing with Cancer’ video is truly inspiring and I thank you for sharing. I have been researching the arts in relation to cancer and fortunately, they are being used more and more to help patients deal with the physical and emotional symptoms of cancer. Kleinfield, Lebed and Molinaro (1986) studied the effects of a program of ballet and jazz on women with breast cancer and found that by combining ballet and jazz movements, the program emphasized good posture and balance. In addition, the music was a source of encouragement for free-flowing movements and a decrease in pain and dancing provided the patient with an emotional stimulus that emphasized her femininity and sexuality during her body transformation (Kleinfield, Lebed and Molinaro. 1986:967). I love the video of the one hand dance being facilitated. I linked to it in my blog as an excellent example of a non-threatening type of dancing that can be done by those in a lot of pain or who have lost a lot of physical strength from their illness. It reminded me of Rosalie Bradford who lost 1,199 lbs beginning by clapping along to Richard Simmons exercise videos. How did you think of the one hand dance? Kleinfield, Margaret, Lebed, Sherry and Molinaro, Jane. Physical Therapy and Dance in the Surgical Management of Breast Cancer: A Clinical Report. Physical Therapy. 66,6. 1986. 967-969. Hi Emily, Thank you for your post! And thank you for your research! I’ll check out your blog. 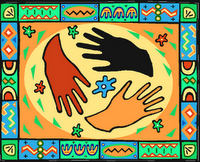 The one hand dance is one of 26 core elements in the InterPlay practice teaching people how to play and improvise movement, voice, story, with stillness, and in connection. These five areas are considered crucial to body, soul, and health by indigenous people. I did a BA in Dance at UCLA, an MDiv at Pacific School of Religion and post grad work in multicultural education. My books Dance; A Sacred Art and What the Body Wants list many of our core practices. See InterPlay.org. and again thanks!